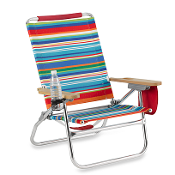 Our beach chair adjusts to 4 positions, offers a swing out beverage holder and a zipper pouch to hold valuables. 250 lb capacity. 20"w x 13"h. Colors and styles may vary.